In January 2016, just after its release, his most recent studio album Games Of Sins entered the charts in Germany, Switzerland, Sweden, Austria, Czech Republic and for the first time in the UK. 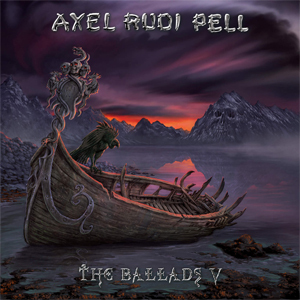 Now Bochum-based guitar wizard AXEL RUDI PELL has announced the arrival of his next offering: The Ballads V is set to hit record stores and digital platforms on 21st April 2017 via Steamhammer/SPV.In true PELL tradition, part five of his successful ballad compilation series features a smooth balance between the past six years and some brand-new songs. For the first time ever in his almost thirty-year career as a solo artist, AXEL RUDI PELL welcomes a special guest star on one of his albums: rock legend BONNIE TYLER has recorded a stunning duet with ARP's longtime singer Johnny Gioeli. AXEL RUDI PELL is justly proud of his new single "Love's Holding On" (street date: 31st March 2017), saying: "BONNIE TYLER only records songs she personally likes. So I wrote this tune just for her and she really loved it. She came to the studio and we recorded it within a couple of hours. The result is amazing - another soon-to-be PELL classic in the making. If I hadn't been a fan already, I would have turned into one instantly." Apart from another brand-new track called "On The Edge Of Our Time", PELL has again risen to new challenges with his rocking version of the ED SHEERAN hit "I See Fire" (known from the motion picture blockbuster The Hobbit), which is an interesting take on one the best ballads in recent years. It shows that even hard rockers like PELL can have a sensitive side, and quite successfully at that. The other seven tracks on The Ballads V (among them a new take on Neil Young's "Hey Hey My My", a live version of the DEEP PURPLE classic "Mistreated" and a previously unreleased live recording of his own fine ballad "The Line"), present AXEL RUDI PELL at his best. PELL has established himself as an outstanding rock star, having sold up to 1.5 million records worldwide. Since leaving the influential German metal outfit STEELER in 1989, he's been out there on his own, recording and touring with some of the finest vocalists from the world of rock music: Charlie Huhn (Ted Nugent, Gary Moore, Victory, Humble Pie, Foghat), Rob Rock (Impelliteri, Driver, Joshua, Avantasia), Jeff Scott Soto (Yngwie Malmsteen, Soul Sirkus, Talisman, Journey, Trans-Siberian Orchestra) and last but not least the mighty Johnny Gioeli, who has been working with Axel since 1997 (having been in HARDLINE before that, a project started by JOURNEY guitar legend Neal Schon in 1991). The Ballads V will be released on April 21st 2017 through SPV/Steamhammer as CD digipak (incl. poster), double gatefold purple vinyl, limited boxset (incl. CD digipck, powerbank, CD slim case single, sticker, photocard - Europe only), download and stream.